The cottonwoods are tall and scraggly, leaning over each other as shaking hands in friendship. This is their world, a place where they can stand undisturbed by little more than a few hikers and the buzz of motorboats. Their size alone gives them an authority that allows them to speak silently, telling stories about their world that reach back over the centuries. This is Pike Island, an small speck in the Mississippi that has been allowed to go back to the way it was two centuries ago when Europeans first arrived. 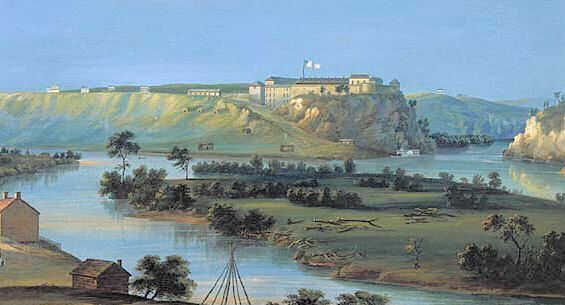 A landscape painting of Fort Snelling and Pike Island from 1844. The one interpretive sign is the only thing that speaks to what humans have done to the place, a small thing tucked to the side in dire unimportance. But what it tells us is chilling all the same. On this island in 1805 Zebulon Pike purchased all the land that makes up the Twin Cities in a treaty with the Mdwaketon Dakota. By 1862, the terms were being so openly violated that the Dakota rebelled, killing many people and causing havoc. The leaders were sentenced to death, but President Lincoln commuted the sentences. The entire tribe was put into a camp on Pike Island, as if to add insult to incarceration. Here, the Dakota were starved and isolated. The sign describes this as a “Concentration Camp”. That’s rather incendiary language, but it’s also accurate. Part of the goal was genocide in the sense that if the Dakota had to choose between playing by our rules or be exterminated. The prisoners hadn’t played by the rules and they were to be starved out for it. 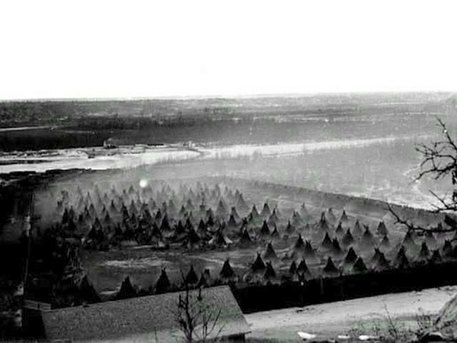 A photo of the Dakota “Internment Camp” in 1862. Courtesy Minnesota Historical Society. The camp was disbanded by 1867 and in 1880 a great flood erased all traces of it. Pike Island was abandoned as being too close to the Mississippi to be reliable; some things were big enough to be allowed to ignore the plans of Europeans. The Dakota were miserable in their new reservation in Shakopee until casino gambling brought them a great windfall. Time erases all physical evidence of the wounds, but not the memories. If the cottonwoods could speak, what would they tell us? Honesty about our past is difficult, but it is essential to understanding how things got to be the way they are. All humans create myths about their own world to help them understand it, but some myths are used to obscure and hide the real nature of who we are. We are a people capable of committing genocide, a people that once did absolutely anything to brush aside people whose only crime was that they occupied fertile, productive land. No myths can erase that part of our nature. We are far better off being honest about it. Pike Island today. 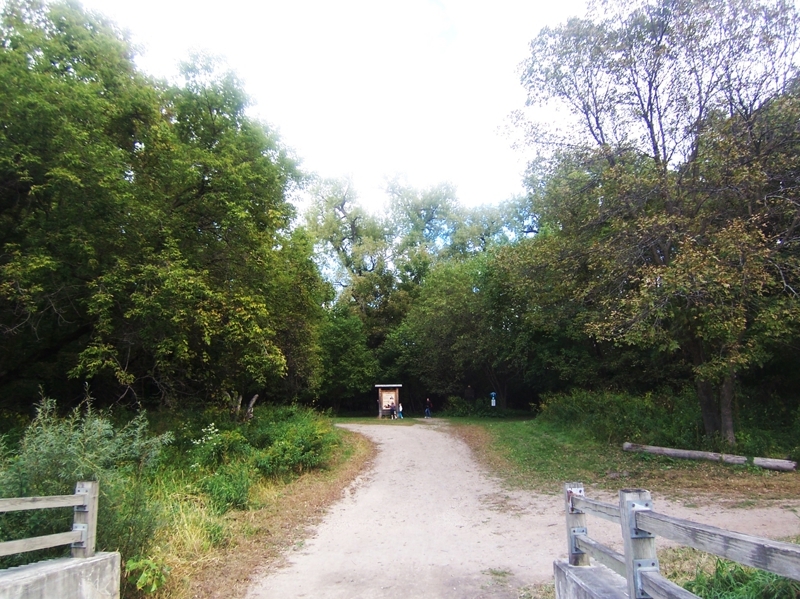 It is a State Park, largely left as a preserve. The small sign up ahead tells the story. Isn’t that declaration, “Concentration Camp”, going to stir up more problems than it solves? That’s always the risk with being honest about our past. Some people will violently reject the truth of the situation and do anything and everything to stomp it back down. It is uncomfortable at best to have to confront the truth and have a proper reconciliation. It is potentially dangerous when truth directly equates all of us with people who have been thoroughly demonized as bad guys without souls. Are we really the same as Nazis? Do we all have this in us? It sounds too terrible to contemplate until you spend time under the cottonwoods. They are bigger than we are and have lived much longer. They know that our world, the world that doesn’t like these truths, is actually rather small and exists for only the blink of an eye. The horrible things that were done to the Dakota happened in a world long ago that we really cannot understand. Yes, this all happened. No, there isn’t a lot of context to help us make sense of it. All we have is a small sign that tells us the truth and a great stand of cottonwoods that, when the breeze blows, nods their approval. It’s best to believe them. The can tell us incredible stories in their own way, stories that put us all in our places. They’ve been there the whole time. This entry was posted in People & Culture and tagged Civil War, Dakota War, history, minnesota, Mississippi, Pike Island. Bookmark the permalink.